When I first started looking in to what was involved with gutter cleaning I thought that you just had to get up on a ladder with your hands or a gutter scoop and get all the muck and debris that was clogging them up out. It seemed so simple. The truth is, that there are several other steps after you get the debris out. Even when you hang up the gutter scoop, your job is not done. The first thing you might consider doing to rinsing the gutters off with a garden hose. You probably dripped and made a little bit of a mess when you were scooping so you should use the hose to wash the inside and outside of the gutter system as well as the siding. Once you have washed away any loose drips or pieces, you need to inspect your gutter to see if any scrubbing in necessary. A gutter brush is a round brush similar to ones you might have used in high school chemistry to wash out test tubes, except bigger. The round brush will scrub the bottom and both sides of the gutter at the same time. When mold or mildew builds up it can be hard to get off without a little elbow grease. If you can still not remove the stains then you might consider some kind of heavy duty household cleaner. But be careful to test the cleaner on a small area of the gutter first to make sure that it does not discolor or damage your gutters. Once the inside of the gutter system is clean, you will rinse with the hose again. Your next step is to turn to the outside of your gutters. Many people are so concerned with getting out the clogs that they overlook the fact that the outside of the gutters is dirty and stained as well. 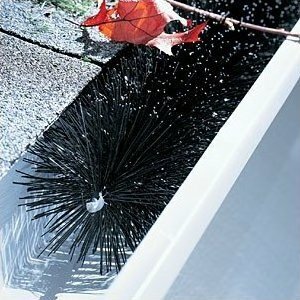 You can clean the outside of the gutters with a sponge or cloth. If something more intense is needed then a scrub brush can be used as well. Remember to follow the same rules about cleaning solutions and pay even closer attention because everybody can see the outside of your gutters. You will be amazed at how much better your home looks from the curb with clean gutters.